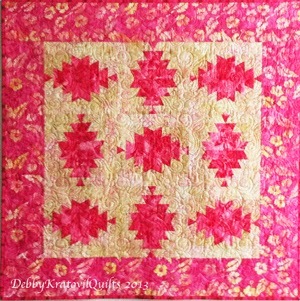 The quilting was done by Kathy Gray - she did an awesome job! 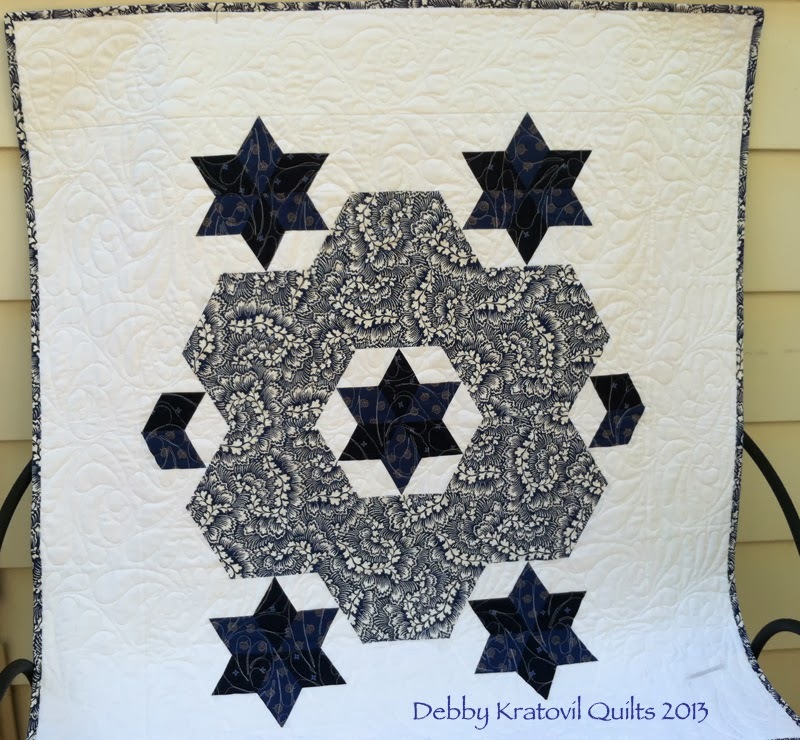 Another quilt I got quilted recently is what I call Stars and Hexagons. No set-in seams. I love how wonderful a simple two color quilt looks. I'm hoping one or both of these get picked up by a magazine sometime soon. I'm keeping my fingers crossed! 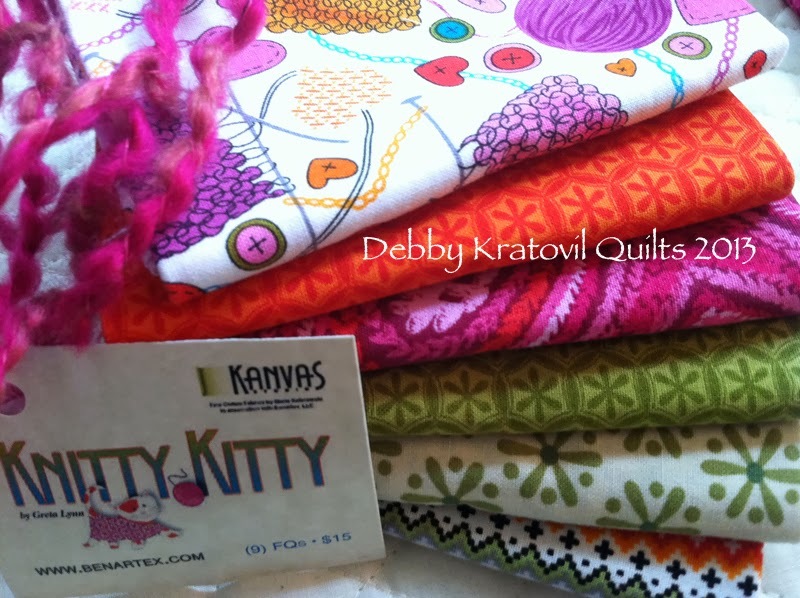 While I am home for 2 weeks between shows, I am so busy with getting all my patterns and kits ready for my last two cities. I have family things going on and am trying to enjoy the last of the autumn sunshine. 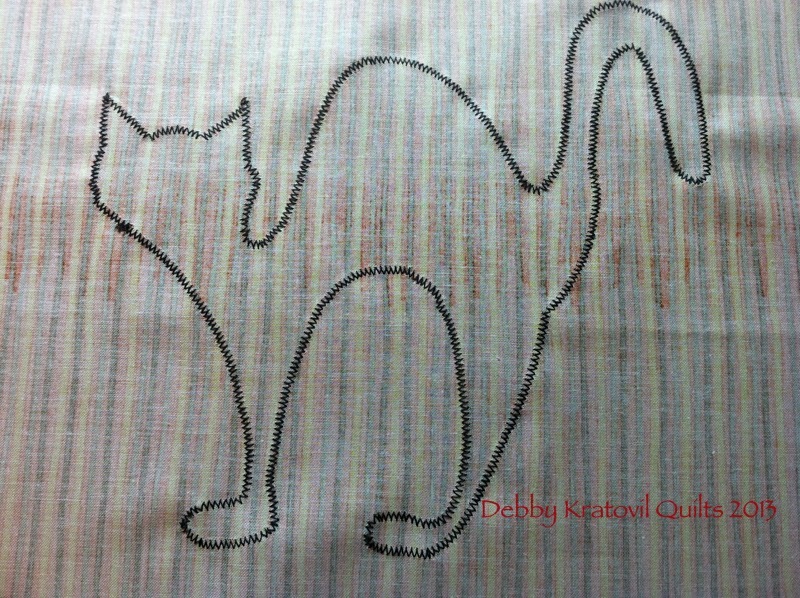 I really want to sew some new ideas. Of course, I can't wait for the "For the Boys" hop next week. I have been enjoying the Wicked Hop but have been intermittent about visiting all the fabulous blogger sites. Work has to come first or I can't pay the rent, right? Hope you enjoyed seeing some finishes I've gotten to. 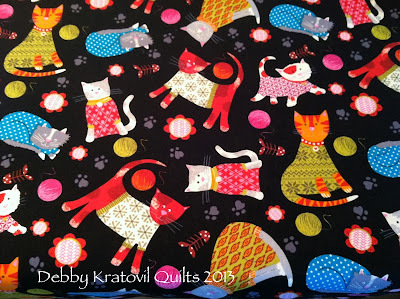 I can't wait to hang these up where I can see them (at least one will go in my sewing room). As a parent of 3 little girls (in the 1980s), I did not want to create nightmares for them - and sleepless nights for me and my husband - so we banished anything remotely related to frightening, scary or wicked when they were young. Hard to do with our Halloween-crazy culture. I feel the same way for my little grandsons. Hence, I searched high and low for a Halloween print that didn't have scary images - only cute ones. 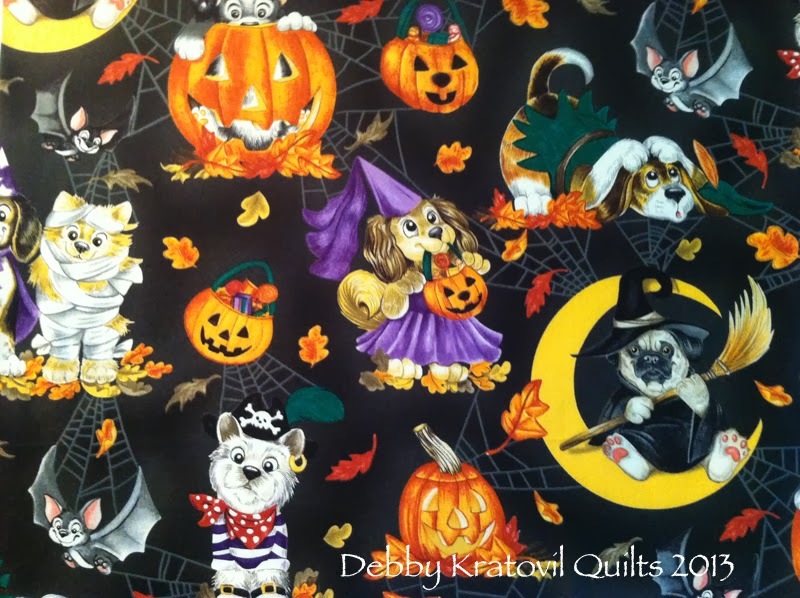 Love this fabric with dogs and cats (and yes, bats). What did I do with it? 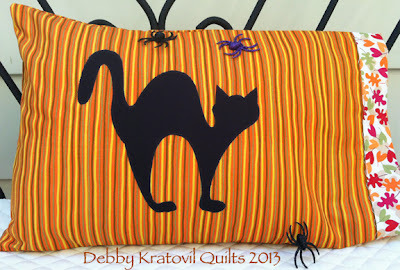 Why, a little pillowcase! But I only had a fat quarter, but it's not enough; what to do? Notice how the front fabric peeks around to the back. I used EVERY SINGLE INCH of both. 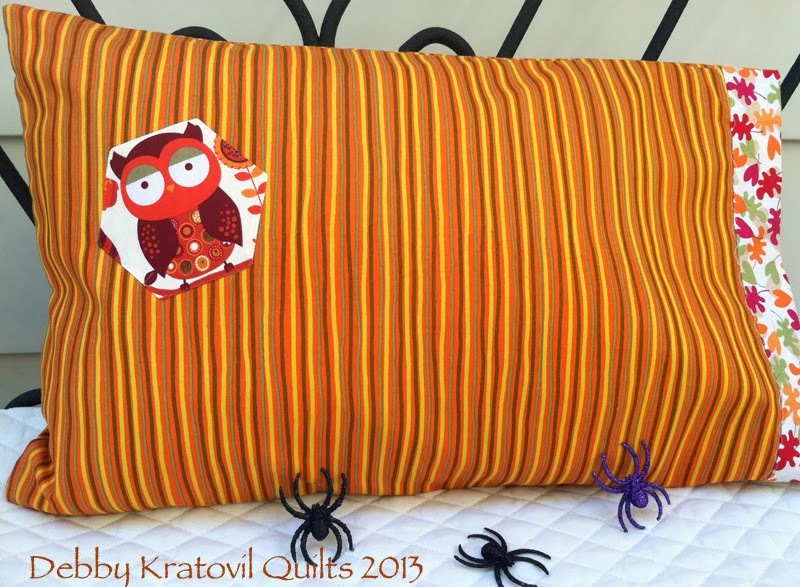 Found an orange, green and black striped fabric for the main body. Added some leaf trim. And these glittery, scary spiders are from last year's Wicked hop. Took a piece of black fabric and added fusible webbing to wrong side . 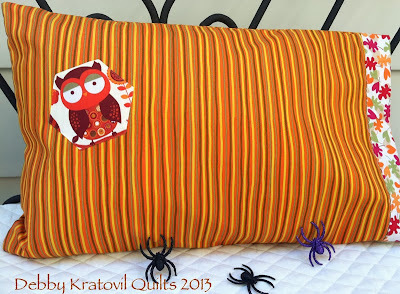 . .
Added a fussy cut owl motif to back of pillowcase. How do I get rid of these spiders? Yes, these are very simple projects. I'm traveling again and sewing time is precious. 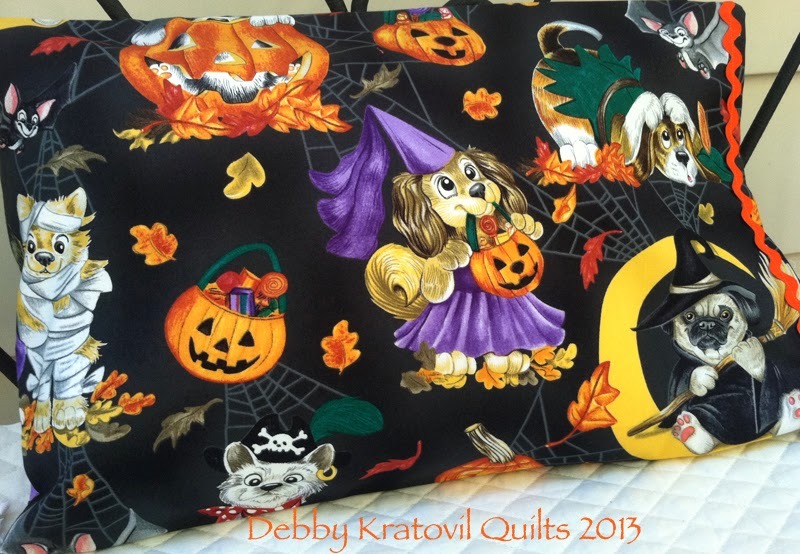 But pillowcases are such fun for my grandson - he loves all the novelty print ones I send. I'd like to thank Wendy and Mdm Samm for hosting and cheering on this hop. 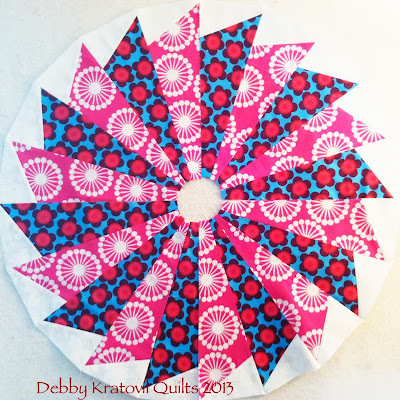 I've done another tutorial for Benartex for their Sew in Love with Fabric blog. It's all about kitties, but I had to change the theme just slightly. I don't knit! These kitties are wearing knitted sweaters. But I can crochet, and so my theme is all about crocheting. So we have to imagine they are wearing crocheted sweaters. Take a visit to the blog site and see what all the meow-ing is about. Visit their Facebook page (those of you who have Facebook accounts) and let others know what you think of those kitties. Now, you have to know I am a DOG PERSON. But kitties are just fine with me, too. 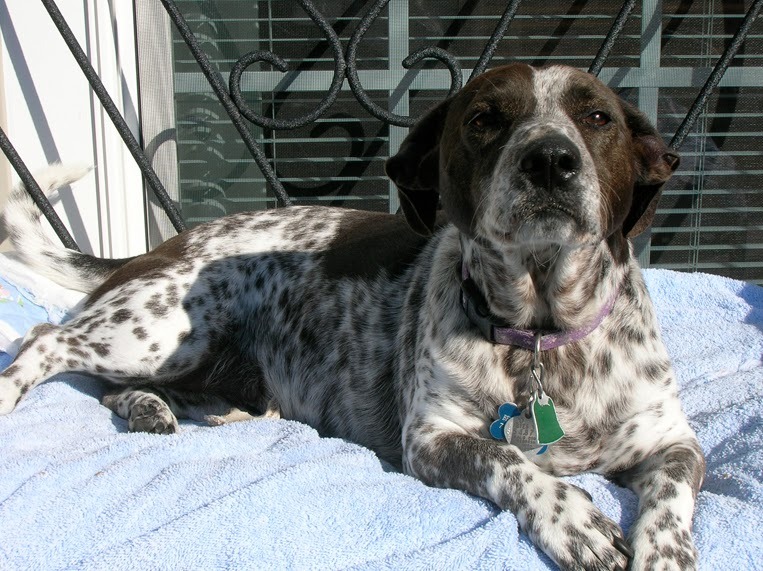 This is Belle, just catching a few winter rays on the back porch. 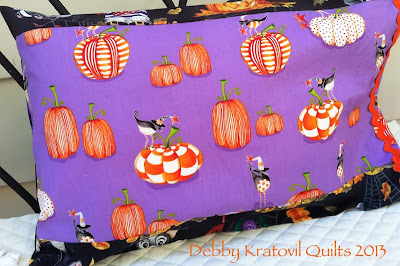 There is a giveaway for those who hop on over to Sew in Love with Fabric and then come back to tell me what you thought. I have a bundle of fat quarters for the giveaway. I used every single inch of the fat quarter of the main kitty print, so I have none of that to share. But the other prints are mighty fine! Contest is over at midnight Sunday, October 20 (Eastern time, USA). I am on the road again, this time in Ft. Worth for 4 days, so I will mostly remain silent, except to the students in my 5 classes! Sometimes Big is, Well - Big! First, just to let you know, I did have a winner in my Batiks Hop Giveaway last week. 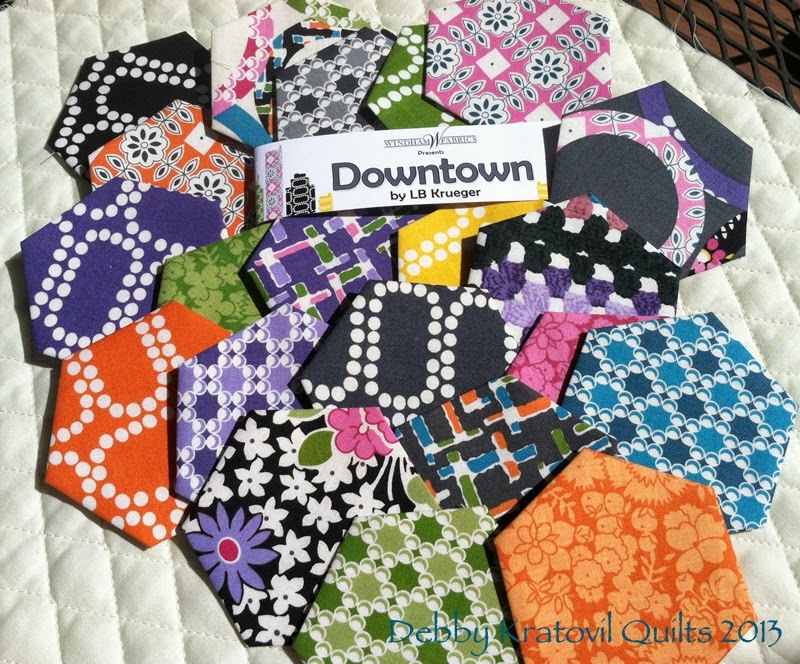 Jeanie of Ft. Wayne, IN won the bundle of 20 batik strips (2-1/2"). Congratulations Jeanie! Now to the BIG blocks I've been working on. 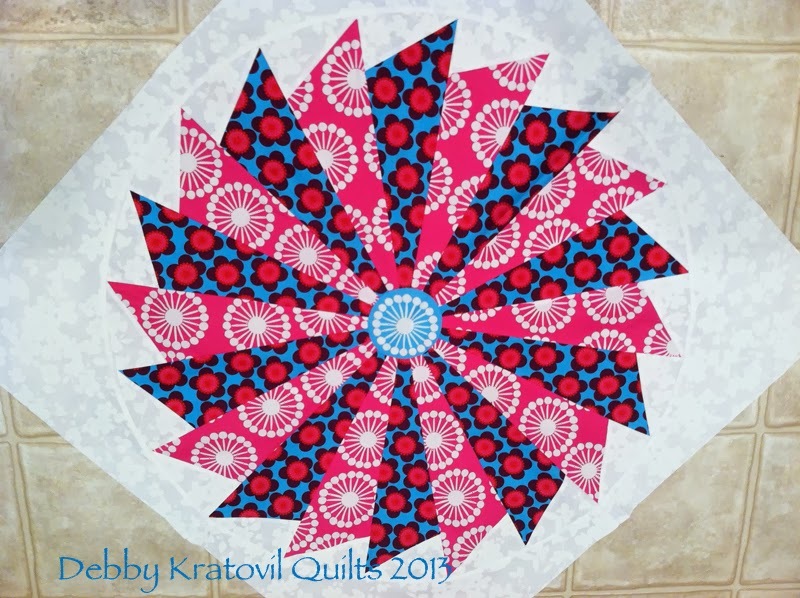 I super-sized my Dresden Ruler from an 8" height to 12" and cut out these wedges from the new Raj Collection by Windham Fabrics. This makes for a very, very BIG block. From tip to tip, this circle of 20 wedges measures 24". I appliqued it to a 30" square background fabric. I think it's a WOW block, don't you? Flirty 30 Buzz Saw; another 24" center. I set it into a curved background and then added a center circle. There are other rulers on the market that make this sort of wedge shape, but there is a LOT of fabric waste. I figured out a way to slice a small triangle off the top of the wedge and insert a white 30 degree triangle. I call it my Flirty 30 Buzz Saw. What do you think? I am a short woman who loves BIG blocks. It's fun to play with them and you have to admit, you can get to your quilt quicker with such large units! Hope you enjoyed the show. I'm off to teach again, this time in Birmingham, AL. Then on to Ft. Worth, TX. My husband holds down the fort and my dog guards it! But neither one ever sets foot in my sewing room. 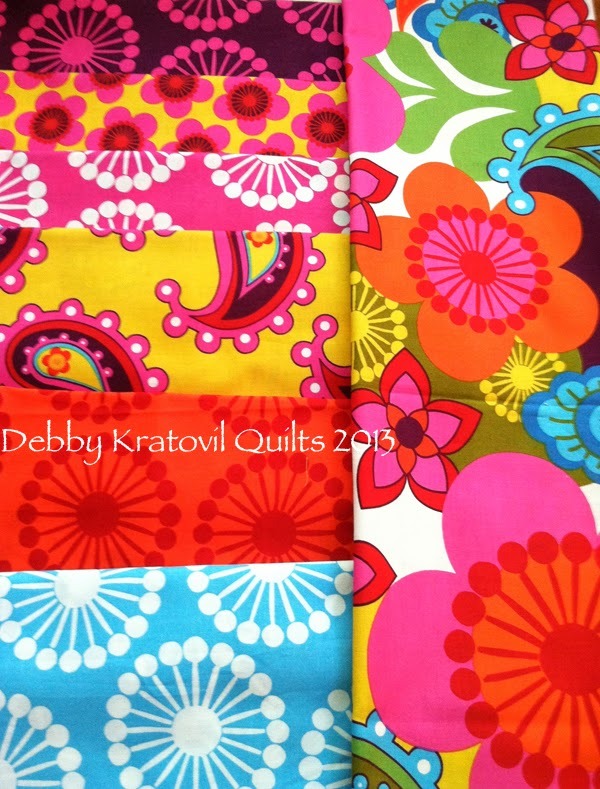 What's in the Batiks Vault today, the last day of the Twist with the 60s Hop? This pair of pillows (I can only find one of these, btw). 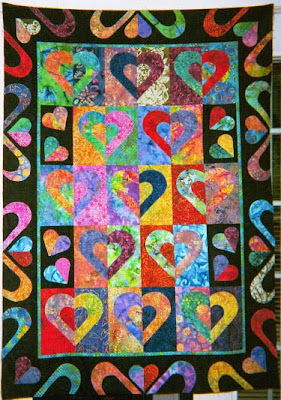 They go with the Colorburst Squares quilt that I've been teaching the past year for the Original Sewing and Quilt Expo. OK. The last bloggers to reveal their blast to the past. Go see the awesome creations they want to show you. What's in my Batiks Vault today? Yes, batiks with black. 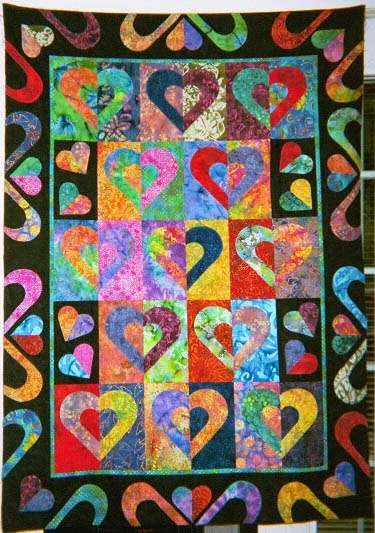 Half-hearts combine to make mirror image blocks. 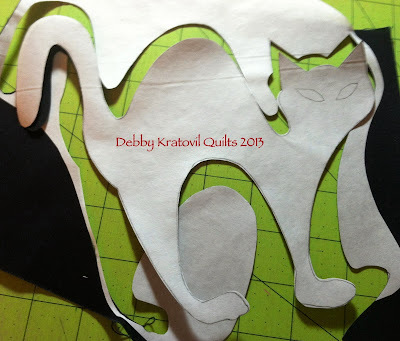 The first of my Cookie Cutter series. 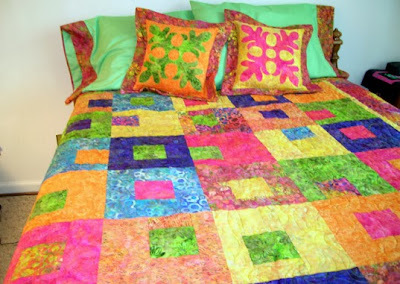 Loved making this quilt. Taught it as a workshop more times than I can remember. I have several other shapes, all done with batiks. Why? 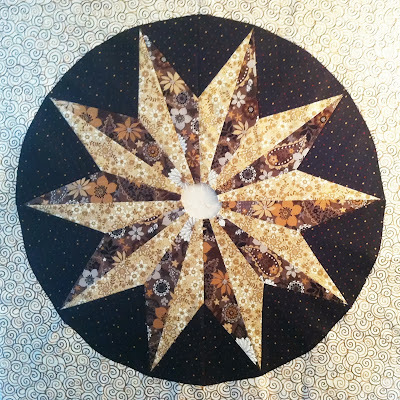 Because it's raw edge applique and we don't use fusible webbing. 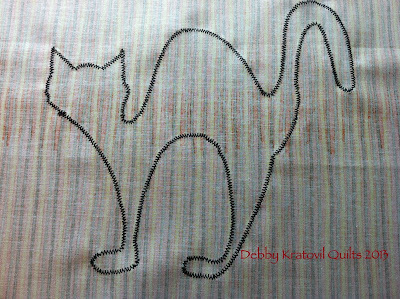 The batiks have a wonderful high threadcount, so they don't ravel like regular quilter's cotton can. Who's on tap for our hop today? Today is Day 6 of the batiks hop. Windham Fabrics created a wonderful line of batiks about 2 years ago and I received one of every single color. What fun. 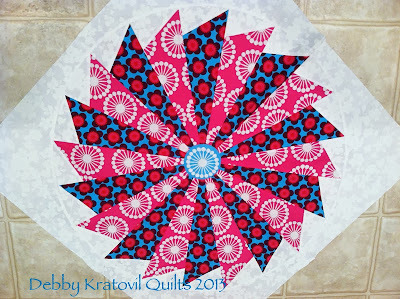 I used them to create this new pattern and template set I call Arrowheads. 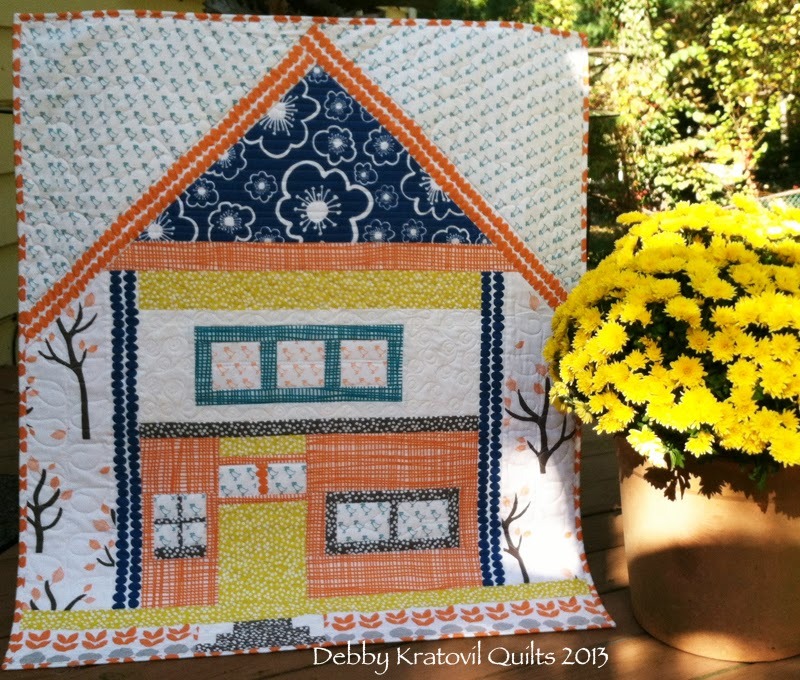 Making a two color quilt is fun. But before I give you the list of bloggers for today's hop, I wanted to show you a new fabric line called Downtown. Windham sent me a charm pack of the 21 fabrics. 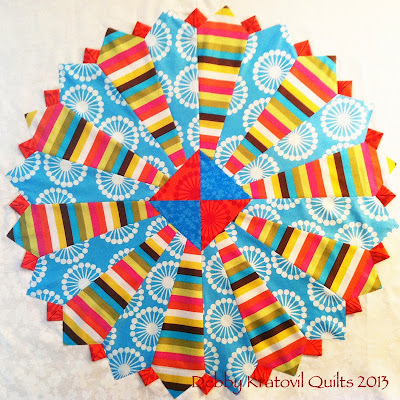 Can you really do something with just a few 5" squares? Of course! I never met a fabric I didn't like. 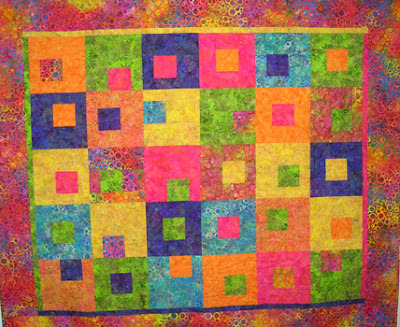 These would appeal to the younger quilter who is coming into the quilt world through the modern quilting movement. I'm sure you can see why . . . These are 2" hexagons. I have a plan to either stitch them into 3 single lines of 7 hexies each or something with added solids. 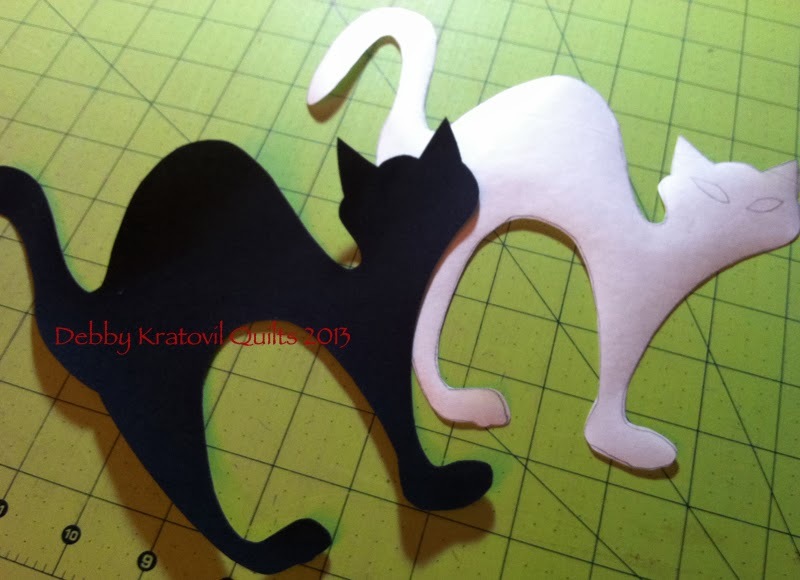 Then I will applique them to a neutral fabric background. For now, they sit and whisper to me: "Hey, we want to become somebody, please?" Stay tuned to see what they will be when they grow up! 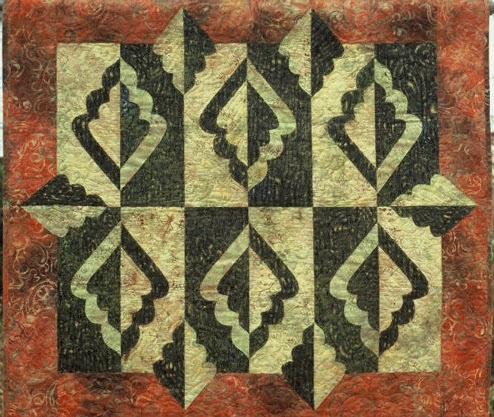 And what's in my Batiks Vault today? Yes, you read that right. These fans were paper pieced on a coffee filter for a foundation! I have taught this class more often than I can count. I keep wanting to retire it, but it keeps getting booked. But it is fun, quick and a great way to use up strips and scraps. 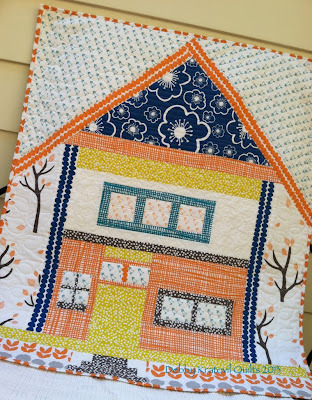 Let's take a visit to those bloggers today to see what they've come up with on this trip down memory lane, twisting with batiks!